If you’re a passionate manga and anime lover, you’ve probably heard about Loot Crate and its phenomenal offer of various collectibles, which are delivered directly to your doorstep in surprise subscription boxes. If you’d like to subscribe to its services, check out what was inside past crates in order to make sure this subscription box company is just right for you. Loot Crate began its story with games. 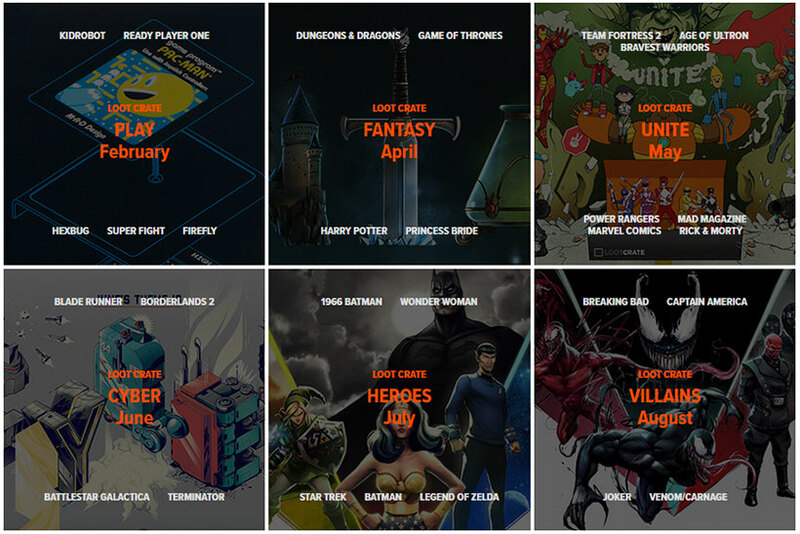 In April 2015, it introduced cool items for Harry Potter, Game of Thrones, and Princess Bride fans. The Loot Crate saga continued with Power Rangers, Marvel comics, and Rick & Morty themed gadgets, puzzles, and T-shirts in May. The summer of 2015 brought us Terminator, Batman, and Joker figures, as well as some amazing items from Battlestar Galactica and Star Trek series. Loot Crate welcomed winter and Christmas with some excellent collectibles such as Back to the Future Hoverboard Replica, Doctor Who Spork Utensil, Han Solo Funko Pop!, Mars Rover Christmas Sweater, and many others. At Loot Crate, 2016 started with The X-Files, The Fifth Element, Space Invaders, The Walking Dead, and Deadpool. Spring pleased Harry Potter fans once again, but that wasn’t all; there were also T-shirts, figures, and games for fans of Daredevil, Batman vs. Superman, Vikings, Hulk, Warcraft, Dragon Ball Z, and several other series. 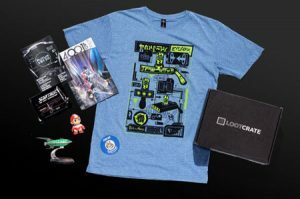 Subscribers of Loot Crate enjoyed the summer of 2016 with excellent Matrix- and Robocop-themed gear, Rick & Morty T-shirt, Futurama Planet Express Model, Harley Quinn Q-fig, Kill Bill socks, etc. Autumn welcomed a line of well-known superheroes. In September, the crate featured figures of The Flash, Batwing Keychains, Battlestar Galactica “Scar” Vynil Replica, and other accessories. October was dedicated to Halloween and zombies, so you could receive The Walking Dead T-shirt and Freddy Kreuger Chopsticks, for example. In November and December, Loot Crate surprised Game of Thrones fans once more, as well as fans of Doctor Strange and Assassin’s Creed. The beginning of 2017 brought collectibles for all Power Rangers, Batman, Tetris, and Lego fans. This was followed by great Wolverine figures, Jurassic world T-shirt, Predator Bottle Opener, and March ’17 Pin. In April 2017, Loot Crate prepared Stranger Things T-shirt, Jessica Jones Q-fig, X-Files Quote Pencils, Batman Heat-Changing Mug, and April ’17 Pin. For more information about Loot Crate, check out full Loot Crate review, where you can learn more about this incredible company and find anime and manga themed jewels for your collection.